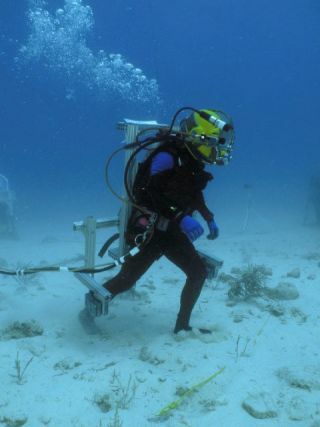 A NEEMO 9 crewmember conducts a mock "moonwalk" while wearing a harness that changes the center of gravity, giving its wearer the sense of only one-sixth Earth's gravity - or about the same as that on the lunar surface. A team ofastronauts and divers is wrapping up a record-setting mission to the oceanfloor filled with undersea "moonwalks" and robotic surgeries controlled by adoctor high and dry in Canada. The six-aquanautcrew of the NASA Extreme Environment Mission Operations (NEEMO) 9 mission are setto return to the Earth's surface Thursday after 18 days of underwater livingaboard Aquarius,an undersea laboratory stationed 67 feet (20 meters) down just off Key Largo inthe Florida Keys. "Everysingle thing that we're doing on this mission directly relates to exploration,"NASA astronaut and NEEMO 9 aquanaut Ron Garan told SPACE.com during aphone call to Aquarius. "One of the big things we're trying to look at is tosee how we can have collaborative effort between the human astronauts androbotic explorers." NEEMO 9 isthe longest NASA ocean floor mission and the longest to date aboard Aquarius. Garanhas been working aboard the aquatic laboratory with fellow NASA astronaut NicoleStott, NEEMO 9 commander Dave Williams - of the Canadian Space Agency - andUniversity of Cincinnati physician Tim Broderick since diving down to theundersea outpost on April 3. Professional Aquarius divers Jim Buckley and RossHein are also aboard the laboratory. "Except forthe launch, we're basically on a space mission," Garan said, adding that the missionis supporting NASA's plan to return astronauts to the Moon by 2020. "We're inan extremely hazardous environment...it's a small confined space with the crew ona very tight timeline." Aquarius isoperated by the National Undersea Research Center at the University of NorthCarolina at Wilmington (UNCW) for the National Oceanic and Atmospheric Administration(NOAA). NOAA owns the ocean-floor laboratory, which has as much living area asNASA's Destiny lab module aboard the International Space Station (ISS). One of thekey goals for the NEEMO 9 crew included the assembly and operation of asurgical robot designed to allow physicians to dress wounds remotely with onlyan Internet link-up between them. Canadiandoctor Mehran Anvari, a veteran of telemedicine experiments with past NEEMOcrews, directed the robot to suture a gash inside Aquarius. But instead ofworking aboard Aquarius, or even aboard a surface ship, Anvari sat at aworkstation in the Canadian city of Hamilton, Ontario, where he directs the Centerfor Minimal Access Surgery at McMaster University. "It wasfantastic," said Anvari of the robot's performance, adding that he alsomentored the NEEMO 9 crew in medical procedures. "Last [mission], we had verysimple robotics and our traditional surgical robots could not fit inside thehabitat." But forNEEMO 9, the aquanauts constructed a small, portable robot equipped withcameras and dexterous pincers to manipulate rock samples and suture needles. Atwo-second time delay - similar to that experienced in Earth-Mooncommunications during NASA's Apollo missions - was also built into the systemto simulate a lunar manned mission. "This alsohas connotations for people on Earth," Anvari said of the telerobotic surgery. "Atwo-second time delay is something that you'd experience if you have more thanone satellite hop for your communications to a remote area on Earth." Anvari alsoused the robot surgeon to transfer ocean floor rock samples collected byScuttle - a wheeled rover designed to test lunar robotic exploration techniques- into a storage compartment. Mary SueBell, a planetary geologist at NASA's Johnson Space Center in Houston, Texas,watched over the procedure, which she said reduces the risk of contaminationfrom human handlers. "Even[astronaut] gloves can present a contamination risk," Bell said. NEEMO 9aquanauts did not leave all of the work in robot hands during their mission. The crew alsotoiled along side Scuttle to assemble underwater structures while wearing aspecial backpack to simulate the gravitational tug of the Moon. "We'veweighed them out to the same gravity they'd experience on the Moon, one-sixthEarth's gravity," Garan said of the aquanaut 'moonwalkers.' "They assembledwhat is essentially a communications relay station." The 20-foot(six-meter) structure is similar to one future astronauts may have to build onthe Moon in order to stay in contact with a lunar base camp on extendedmoonwalks, the aquanauts said. "The lunarhorizon is only about 1.5 miles (2.5 kilometers), and if they go beyond that we'regoing to need to communicate," Garan added. "This structure would allow us toextend our communications range out to 5.9 miles (9.5 kilometers)." Garan saidall of the lessons learned from NEEMO 9 and future Aquarius expedition will bepooled alongside NASA's Apollo experiences in a comprehensive database tosupport the U.S. space agency's human space exploration efforts. NASA hasused the Aquarius laboratory as a training ground for space stationcrewmembers, including astronaut Jeffrey Williams who served aboard NEEMO 3 in2002 and called the underwater outpost last week from the ISS, where he servesas Expedition13 flight engineer. "One thingthat we don't have here that you guys have down there are all those littlecritters outside," said Williams told the NEEMO 9 crew from orbit, adding thathis first few days aboard the ISS were exhausting. "I remember on Aquarius,just sleeping very well. That was some of the best sleep I've ever had." Much of thesupport for the NEEMO 9 crew - which includes wireless communications from theocean floor, as well as high-speed connections for video, data and Internetaccess - has been due to a five-year effort to turn Aquarius from a coral reefcamp into a robust undersea laboratory. "In thecourse of these missions we've increased the bandwidth by 10 times for ourreal-time data communications from the sea floor," Andy Shepard, NOAA's UnderseaResearch Center director for Aquarius, told SPACE.com. "It was the bigleap forward that we needed to really make the lab what we needed." About$500,000 in NASA support over the last five years has allowed Aquarius - the lastof NOAA's saturation diving platforms - to reach its current state. The agencyis now working with NASA and the U.S. Navy to develop a mobile saturationdiving platform that could aid in submarine rescues and marine studies. "We're nowlooking for a suitable chamber that would be cost effective," Shepard said,adding that the chamber would initially be used as an Aquarius extension. "We'dstart off by doubling the living area of Aquarius. It's one of the morecomfortable habitats...but we can use some more space."